Show and Tell from tonight's Moda University. Teresa's strip quilt from the book 'Strip Delight'. We sat with our fabric rep for Hoffman & Andover yesterday. I thought I'd let you know what we have ordered so you know where you can find certain lines when they come available!! As usual, I will post them here when they are in the shop! The Hoffman Challenge 2009 is very subtle. It is based on the pale greens and rich browns that we are starting to see in the home dec industry. This should be here in December sometime. 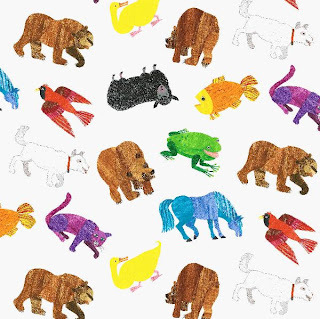 Brown Bear from Andover, just like the children's books, will be here in January. We are getting the full line. This fun line has bears, foxes, and crocodiles singing and marching through the swamp. Perfectly accented with frogs and red mushrooms for your next whimsical project!! Cuter than cute cupcake pincusions from Moda. 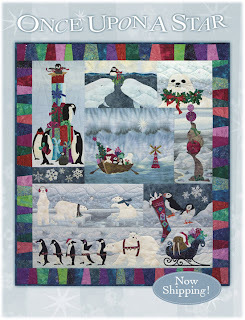 What a great gift for a quilter or that young lady on your list. Jellyrolls for your next project are here. There will be more strippy classes durning the next class term (newsletter will be out in late December). More fabric coming almost every week. Prairie Paisley by Terry Atkinson for Red Rooster is here! What a bright and cheerful line!! Moda brings Sleepytime to your little one with this soft, sweet line. Great for when you don't know what the baby will be... except wonderful! McKenna has created Christmas at the poles and highlights the wonderful creatures that live there. Each pattern is sold separately, but we have all 8 of them in stock.